ROLL CALL: Raise your (virtual) hand if you’re a…. Wonderful. Thank you for being here! In essence, we’re here today to talk about how we can build schools that put love and liberation at the center of everything they do. As always, in order to make some progress, we’ve got to have some honest and perhaps uncomfortable conversations. I reviewed countless written policies and procedures (including employee and student handbooks). I collected data by conducting interviews and circulating surveys to teachers and parents regarding how discriminatory policies and practices have affected them and their families personally or if they’ve witnessed other people being discriminated against in school settings. What does a dress code have to do with it? Dress codes proved to be a very hot topic, actually. It is alarmingly common for black women’s natural hair to be deemed “unprofessional” for the work place. Beyond being discriminatory, this is downright racist, but somehow this practice of policing black women (and children, for that matter) for their hair is normalized. Seen as acceptable. If I told you that there were schools in which all women were required to wear skirts or dresses everyday, would you believe me? ‘Is this even legal in 2018?’ Apparently so, because some teachers mentioned working in schools that required them to wear these garments on a daily basis (even those who were working with the youngest of children). Hello, performative gender norms in action! Visible tattoos and piercings are often not allowed in school settings. But why? Largely because they’re seen as a rebellious act of “counter culture” in the West, it seems. We can’t forget, though, that cultures around the world have used the art of adornment (from tattooing and decorative hair styles to piercings and cosmetics) to establish personal and social identity throughout history. In these cases, we ask people to erase their respective cultural heritages in order to fit into our notions of what constitutes “professionalism,” ideas which may very well be entrenched in ethnocentrism/Eurocentrism. School leaders, how would you respond if it was brought to your attention that your employees were making negative remarks about a child and their family’s identity? What course of action would you take? In my opinion, this is inexcusable. Unfortunately, these, too, are just a couple of examples of too many. More unfortunate is the fact that most folks who work with children get away with these sorts of comments all the time. What happens when we come into learning spaces weighed down by these kind of judgments and biases? Regardless of your personal beliefs, every child (and family!) deserves to come to school and feel safe and free enough to be their whole, full selves. Does this look like love and liberation in action or does it mimic oppression and maintain the status quo? We simply don’t get to say our schools are “inclusive” or “value diversity” if they require students, families, or staff members to suppress certain layers/ aspects of their identity for notions of “professionalism,” “appropriateness,” and “normalcy” that are likely entrenched in racism, homophobia, heteronormativity, xenophobia, classism, etc. Our good intentions aren’t enough. We have to walk the walk. Let’s work together to build the loving, liberatory schools our children and communities deserve. Deepen your ability to recognize the ways in which oppressive and discriminatory practices present themselves in our schools—from HR policies to curriculum? 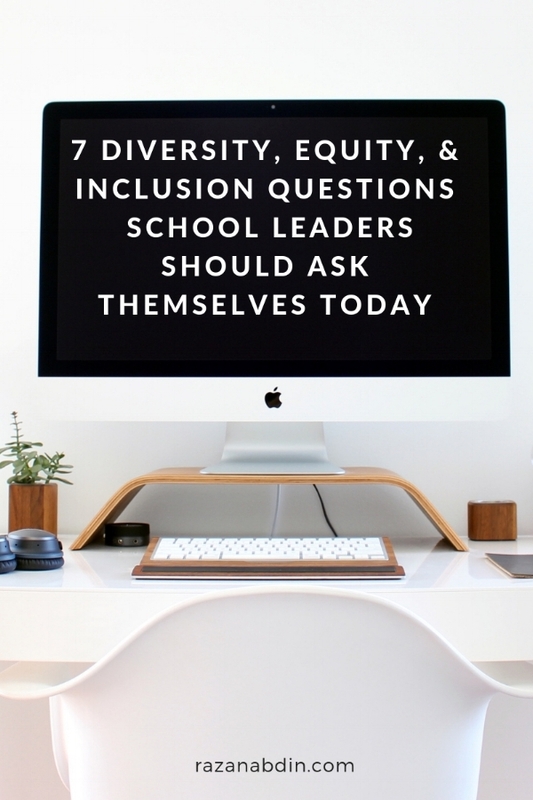 Actively brainstorm ways to ensure that our policies and practices are inclusive and that our curriculum is culturally sensitive, accurate, and representative of our increasingly diverse schools? If so, join us for a webinar on Sunday, October 7th. Razan Abdin-Adnani Consulting and Coaching, LLC is a woman (of the Global Majority) owned business in NYC. We offer sliding scale fees for all our services in order to ensure accessibility. Book Razan for coaching, consulting, or trainings here.